A flow-injection biosensor-like system based on a nonenzymatic approach has been developed to determine the carbamate pesticide carbaryl in complex biological samples without lengthy and expensive extraction steps. Molecularly imprinted polymeric beads were used to immobilize carbaryl from biological samples. pH variation permitted the elution of carbaryl from the binding cavity to the flow cell. A pH electrode was used to detect changes in the charge of carbaryl in the sample solution resulting from the protonation and deprotonation of the molecule over different pH ranges. At pH 2.0, the secondary amine group is protonated, giving a (+1) charge to the carbaryl molecule. At pH 8.0, the ionized carbaryl loses a proton to become neutral, changing the local pH of the flow cell. The pH change at the flow cell generated by the deprotonation of carbaryl ion in alkaline medium was used to determine the carbaryl concentration. Parameters influencing the performance of the system were optimized for use in the detection procedure. 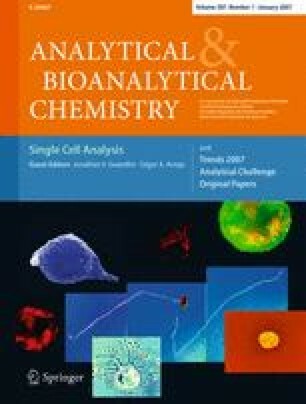 The validated biosensor-like system had a carbaryl detection limit of 10.0 μg/mL and a response that was linear (r 2 > 0.98) over the concentration range of 10.0–00 μg/mL. This work was made possible by the support of Charles River Laboratories Preclinical Services Montreal, Inc. (CRM) and Concordia University.